Have you seen this SOBE Life Water drink commercial Thrillicious that was done for SuperBowl 2008? They're still showing it so you may have seen it recently. Did you notice the fart? Notice at :49 seconds in. Nice! Not only does Flower have a farting problem... this video of Bambi sped up is a scream! Farting Flies Burp & Fart Jingle Bells: This funny animated fart video animation is of flies farting and burping the Christmas tune Jingle Bells. We know how proud you are! Now you too can show off your fart pride with this Support Farting ribbon car magnet. Of course you you'll want to pick up more than one of these! Support Farting Car Ribbon Magnet. A humorus twist on an old favorite. Support and express how you feel with these new novelty car ribbon magnets from Bewild. Place on vehicles or display them at home or in the office. Show a different kind of pride. This novelty magnet says "Support Farting"
If you loved Jurassic Fart video then you should like this rendition. Be sure and check out our other favorite farting dinosaur video done for the Canadian Milk Council. The Fart Train: Found this fart video on YouTube. Would like to know if this was actually produced to be shown somewhere other than You Tube or if someone just had a lot of extra time on their hands. 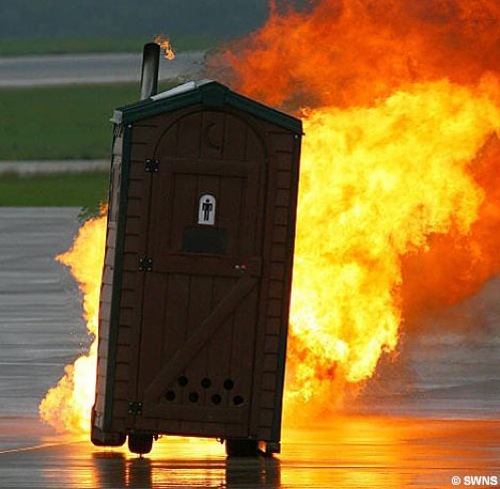 Q: Is it ok to smoke in a port-o-potty after you fart? This is, apparently, the world's fastest toilet. Powered by a Boeing Jet engine, the $10,000 vehicle's top speed is in excess of 70mph, and it farts flames from its tailpipe. Check out the post and see actual video of this toilet in action. Farting baby in this funny commercial for Pampers diapers. The company that makes Pampers certainly appreciates good fart content as seen here in another baby fart Pampers diaper ad.